Welcome to our first dev blog on the upcoming ‘Warriors of the North’ DLC. One of this expansion’s major features is going to be a little thing called ‘company origins’, and that’s what we’ll be talking about this week and the next. Let’s dive in! 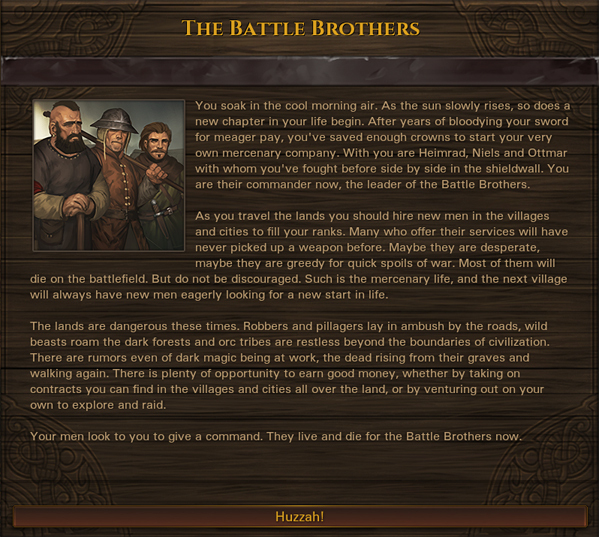 Until now, there’s been only a single way of starting out in the world of Battle Brothers. Because the game is otherwise designed for replayability, this is an area we really want to tackle with the upcoming ‘Warriors of the North’ DLC, both to further improve replayability and to accommodate different play styles. The established way of starting out in the world, your company origin, you likely know well by now: your company is nearly wiped out by a brigand named Hoggart, and it’s up to you to rebuild it. This origin remains available in the game, and it’s a good way to start for new players, but it’ll be just one of many possible origins to choose from. For starters, the free update coming with the DLC will introduce a second origin which immediately drops you into the world without having to deal with Hoggart. It’s reminiscent of Early Access days, and it even has the old introductory text and music that some of you may remember. The ‘Warriors of the North’ DLC adds greatly to the selection of origins. Each of those comes with a flavor introduction, different starting characters, equipment, resources, and special rules for your campaign. Some origins change the game more than others, but most of them impact it from beginning to end. Because the game is and always will be fundamentally about leading a mercenary company, all origins will ultimately lead to this – but they do add new challenges, accommodate different play styles, and provide roleplaying flavor. If you own the ‘Beasts & Exploration’ DLC, you’ll also get a bonus origin centered around beast slaying. Let’s take a closer look at two origins that the ‘Warriors of the North’ DLC adds to the game – just keep in mind that things are in active development and might still change! 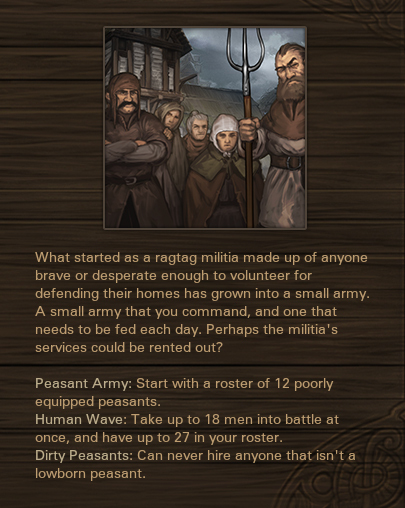 If you prefer to overwhelm your enemies with superior numbers, or even just equal numbers in the late game, but still want a balanced game, then the peasant militia might be for you. The militia starts not with three companions, but with a full roster of a dozen characters from various civilian backgrounds – daytalers, farmers, butchers, millers, and the like. With these kind of people, you’ll want to rely on numbers, so you’ll be able to field 18 men on the field at once, instead of the usual 12. The downside is that you’ll never be able to hire any noble or high tier combat backgrounds to join your mob of angry peasants. You’ll start with lower renown and crowns, but a home village that idolizes you and gives you great prices. 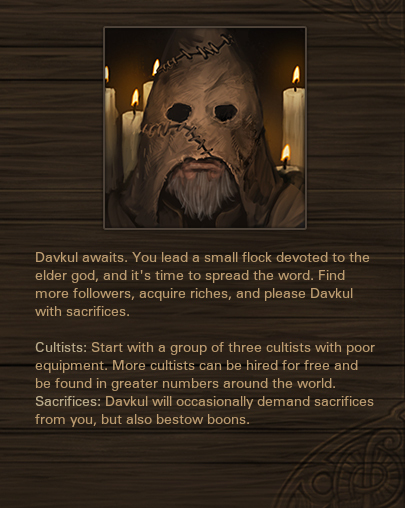 For a different experience, and some roleplaying flavor, you can also start the game as a wandering cult that worships Davkul. You’ll start with three cultists, and more cultists will join you without any hiring fee. Cultists can be found more often in any settlement, and they may also flock to you in new events. Your god will demand sacrifices, and you’ll be expected to cull the herd and give lives to Davkul in bloody rituals. All cultists will rejoice upon this gruesome occasion, and Davkul may bestow upon them permanent boons. Of course, anyone not a cultist in your company may have a different reaction to the proceedings. Having a special relation to your god will also make certain late game cultist events much more likely to trigger. There’ll be plenty more origins to choose from, of course. Join us again next week when we explore them in part two of this dev blog! This is great because I can find new goals to my campaign. I’d like to ask you, if the fact of starting with 12 party members, makes you thing in changing the balance of the campaign. For example: instead of fighting the first days against 7 thugs or 4 ancient auxiliaries, we can expect larger enemy parties at the beginning (12 thugs or 8 ancient auxiliaries). Really cool feature. great stuff fellas. Moar! I would love a monk background if possible, you would only be able to hire monks and there would be more monks available in towns than usual, you wouldn’t be able to hire anyone else other than monks. Hello i have a few questions pertaining to the overall state of the game. i hope to break this down in a format that is easy to read and hopefully be responded to. i first want to say thank you for everything that “you” the dev’s do for the game and as a member of the BB’s community i wish nothing but positive growth and content to be displayed and added to the game. Question 1.) Would you consider adding in more flag variations, different color’s and symbols would be greatly appreciated. I get that there are already a decent amount of banners to choose from but with over 500 hours played they loose that special something after you have had so many campaigns. Question 2.) Is there any plan’s to add more variety of color for armor i.e. shields, helmets, and body armor. I love the new color system now where you have to make the colors with things you collect on the map, but it seems shallow of a concept lacking diversity not just for the shields and helmets but color pallet of the armor’s as well. Opening a much wider variety would be greatly appreciated. As of now you’r only allowed to change shields and helmets but hoping that i could dye my armor a simple shade to almost form a army, or possibly add in cloaks or poncho type cloth over the armor with the company’s colors. This i believe would satisfy my itch for maintaining a certain color scheme for my wondering mercenary army. And maybe adding in more color’s like purple, darker blue’s, red’s, orange’s, yellow’s, green’s and all white, or all black. Question 3.) Have you ever considered opening up a “Build a Bro” workshop, lol. This is only used at the start of the game, non iron man mode exclusively. This option will allow you to pick your 3 starting bro’s traits and star placements. The amount of star’s are the same as now just placed differently if you choose, and i believe you get 4 stars for each character. This way it allows you as the “player” to choose how easy or hard a start you want, and allowing a wider variety of campaigns to be played out without having to “seed” search for 4 hours. As you know there is a seed data base at https://bb.frukso.se/ this is a lot of trial and error but does not feel satisfying when your starting bro’s have god stats but the map is terrible. Question 4.) Along side a new DLC im inquiring if there are any new additions to the perk tree, and if not will there be any significant changes to the current perks as we know now. The perk tree is actually one of my favorite parts of the game. I can see a few new options to add in or a change in the current perk system, small tweaks and benefits. First maybe add in a few more branching paths to perks, Example #1 ~ path finder being able to add on swiftness after “x” amount of steps, which in turn will decrease the amount of fatigue used and or the amount of action points spent over all, Example #2 ~ bullseye after “x” amount of hits it cuts the percentage from 50% to 45% decreasing 5% every time to a maximum of 35-25% allowing a marksman to truly feel like a sharpshooter. Example # 3 Brawny the heavier the armor you get 30% or 25% fatigue reduction, for this add in a scaling timer, so that over time your character gets used to the weight and the reduction percentage gets higher and you get more of your fatigue back, this will help a lot with struggling classes like miners, cripples, vagabonds ect. to be actually playable long term. Question 5.) Goblins this as a enemy group is fun on paper but in the game its a constant struggle to pin these little bastards down. Are there any plans of soft nerfing them a little so that they are not of a huge struggle early/mid game when they are at their worst. Far to many times i have lost many a great brother because i got pelted with arrows and could not hit them with my archers. It just feels a little to cheesy to me, and i am a save scummer so thats saying something xD. Question 6.) Additions to the mercanary company as a whole. Let me explain this one, the cargo limit set i believe is around 170. Can we get a increase on that with a wagon tier system to bring the number up to around 250-300. 170 is a lot of space but i always seem to be at max capacity late game when im killing everything but forgetting to sell at towns. Possibly adding in a bank/depo system where you select a town as a “home port” and this will allow you to store extra item’s in game you want to keep but do not want to carry around this of course will cost a fee/continuous fee like paying your brothers salary every day, The more you pay the more space you get as well up to 3 upgrades of around the 150-170 range (for the depo). Maybe add in a secondary banner flag, this second banner will cost 7,000$ gold but will be much more decorative and have slightly better boosting stats for moral, ( i usually run 2 poll arms with rally and i wouldn’t mind a second banner thats bigger and more decorative for my main rally men, while also having the starting banner on my secondary rally bro to off set giant waves of blueberry’s i.e geist.) Another option is to purchase your own boat, this is a hefty investment but allows you to sail anywhere without paying the fee’s of traveling, this boat would cost 15,000$ gold late game this is useful. Question 7.) There are a lot of traits that can not be removed, hoping this will change as i think every trait should be able to be gained or lost, preferably lost because a brother who is clumsy, cocky, short sighted, craven, fainthearted, fragile, and hesitant are all detrimental for the most part and maybe being able to lose these traits and replaced with counter acting ones will be good for character development, making you that much more invested in throw away characters as they can be saved. So for fragile after “x” amount of battles they become battle hardened gaining in strength after combat and will become “fit” gaining 10 hp back. Cocky after a squabble with another brother they lose the breath holding competition and become “humble, losing the moral +5 but gain back the -5 mele def and -5 range def. These are just a few examples. Also with losing traits brothers can gain more than the standard 2 traits allowed, allowing them to stack 3-4 positive traits giving them again more depth and better character development, making people feel like they’re important and not to be lost in battle. Question 8.) Town development as i see it is not a focus at all for you, is there any chance you may change your mind? This is not a sim city game, nor is it a build’em up game. But allowing players to spend a little bit of gold on some smaller settlements giving them a chance at a random extra commodity or coming back to town finding out the councilmen or mayor spent all the money on booze and solicited company would be really cool. Of course there would be a limit to upgrades, and out of each faction one small settlement can be upgraded to a bigger town, but only 1 in the entire game. As well as the guard towers near settlements feel completely useless are there any plans on doing anything with that, i suggest maybe making it a rest stop along the roads with a very small vendor at each one selling over priced items at the cost of convenience and or potentially hiring a militia guard that was serving and decided to quite his post and joining your mercenary company. Question 9.) Weapons feel reasonable in damage and i find them mostly balanced. Are there any plans to add in more weapon variety? The last DLC was great by adding in a couple more, hoping this expansion or even a solo expansion can give us a much more broad variety of weapons per tier. Maybe adding in more legendary weapons as well with new looks for each one. And bow’s and crossbow’s feel bland until legendary’s they need a small boost in flavor for regular renditions, adding on tassels and or different types of wood used to create them giving them different stats and different play styles. Also are there any talks of adding different types of ammo into the game? Nothing crazy but fire arrows would be nice, or arrows dipped in holy water to fight off the undead/necrosavants. Question 10.) Enemy variety? There are plenty of things to kill in BB’s but as i understand it your adding more enemy’s into the game, hope this is a continuing trend per DLC released. Has the studio thought of adding in any other types of enemy’s and ill throw some ideas out there. first vampires and werewolf’s each one deadly and i feel like both fit into the theme of the game without going to far off kilter. Possibly different factions as i believe your doing in this DLC with some Nordic tribes, correct me if im wrong or miss understanding this, so also Dwarven/ elf factions, this may cross the line of what your game wants to be but there’s already orcs, goblins, lindwurms, schrats and a kraken so its not to far fetched. Maybe adding a brigand community ran by one head brigand, this would involve 3-5 settlements increasing in difficulty the more you clear and the end camp would be massive around 20-35 raiders and the brigand boss has unique armor and weapon, of the 20-35 raiders at least 2-3 will be brigand leaders. In conclusion i have a lot of questions and i do appreciate if you take the time out to read all of this. I am very passionate about this game as many other fans are. I’m sure you get bombarded with “idea’s” all the time but i do hope that you take some of the ideas from the community as a whole and implement them later in the game, letting us know the fans that our feedback is actually heard and recognized for the betterment of the game. I’ve been writing this since 2 a.m. it is now 4 a.m. so the better half of 2 hours, and its time very well spent. Hope my questions didn’t come off as long and boring and that they are easily understandable. Again Thank you so much for making this game and continuing to make more content, easily my favorite game of all time and i really, really, really appreciate it. Would be able to choose from ´´Crusaders´´ background? Like having one Noble, one Hedge knight and two Squires from start with a goal to get rid of some big boss like maybe Vampire or some kind of Abomination? Or I would really like Hero background, where you will have just one Hedge knight, who will can have just 5 more companions and other Hedge knights will never trigger that fight event. Idk :D maybe something like that :D we need little good for this mad world. was my comment too long to be posted or responded too? I’m soooo glad about backstories!!! I think you also add alignments to all recruitable bros? Like “lawful/neural/chaotic”. For example, knights, squires and witchhunters will definitely be the former; and raiders, thieves and wildmen be the latter. It’s for roleplaying. You can start as some sort of Inquisition, so all good guys will be twice cheaper and baddies are unavailable at all; or vice versa, if you’re playing as evil gang. Neutral ones will be more expensive because it’s hard for an average Joe to maintain rigorous discipline or be a merciless cutthroat, correspondingly. Though some more backgrounds need to be added. You already have some, like cultist is an evil counterpart to monk, raider to squire… maybe add necromancers and raubritters as higher-tier villains? Well, you got it :) Actually, you already made some job to this direction, because I noticed that of three noble houses one is always sort of good, one is bad and one is something in between. But enough with that. Magic! That’s what game lacks. Yes, it has shamans, witches and necromancers, but maybe some weaker bros can take some spell perks, available only to them? I don’t mean fireballs and alike; no, something simplier, like monk who can heal allies or cultist who can curse enemies. And dual-wielding. C’mon, isn’t it cool when a bro can hack enemy’s shield with an axe and then add a stun with his mace in the same turn? True, these strikes should take more fatigue and/or AP, as dual-wielding was somewhat exotic in real-life Europe, but corresponding perk could negate this malus. And, if bro has both similar weapons (like two swords) AND mastery in that kind of weapon, strikes should take 1 AP less. Also, pay attention on what Nobal posted. Really, if you have a backstory that allows to hire 1,5x more “weaker” brothers, maybe you should make a reverse? It’s a great idea to add a small side of RPG !! I’m impatient to discover the rest of this new DLC. I wrote some suggestions inside the “suggestion forum”. These suggestions are locked since 2 weeks and more for my first one. Do you stop this forum ? Do you take into account the players remarks ? Ooooh the cultist origin is just what I asked in the previous dev blog, I’m so happy !! !